Travelling to Cambodia? Everything you NEED to know! 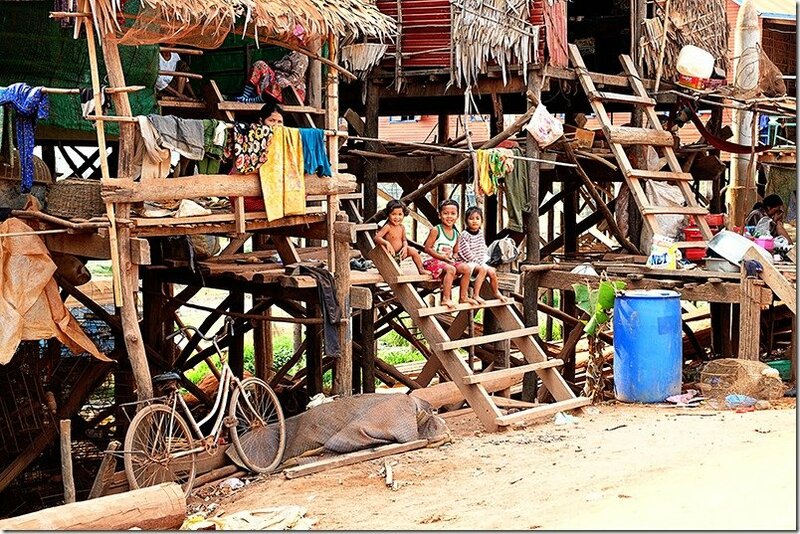 Cambodia is one of those sorts of places that might challenge the way you look at life! A country of red dust, of hot weather and a heavy-hearted history. A country where poverty and hardship of life is always visible. The holder of the eighth wonder of the world, together with many other monuments and temples that is built with grandeur and splendour in mind. 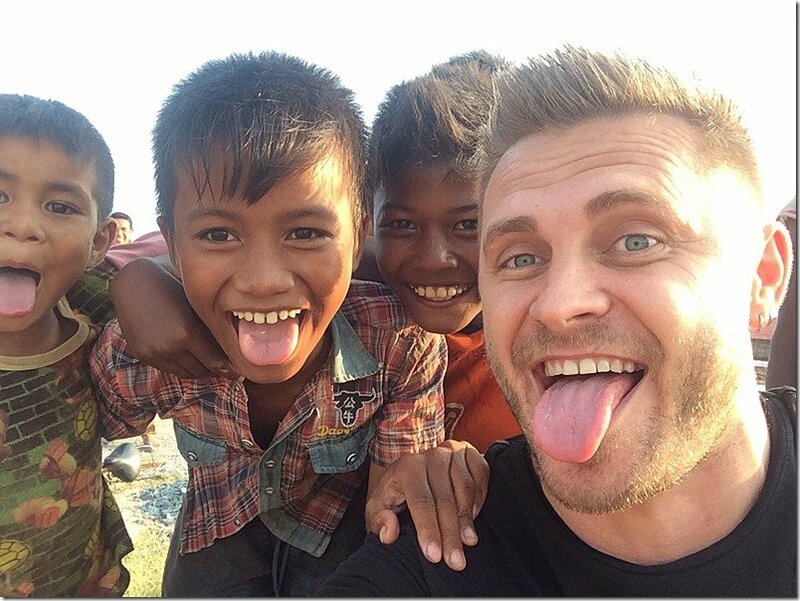 This country though, is about more than just the Angkor temples, this country is about the people who live there! The forever smiling friendly faces, the hands waving eagerly as you pass them by. The people who are proud of what they have achieved and despite having so very little are grateful for what they do have. Cambodia will leave you questioning your way of life, it makes you mindful of the things you do take for granted on a daily basis and it will make you appreciate how fortunate you are to be traveling to a country that is so raw and so exposed by the gentle nature of their souls! Whilst many tourists never venture far from the typical popular destinations of Siem Reap and Phnom Penh, it is beyond these cities, that you will discover the true essence of the Cambodian way of life. A trip into the rural areas and countryside of Cambodia will allow you to experience the ‘real’ side to this layered country. Listening to the stories of the people and learning more about their typical daily lives. Travelling in Cambodia might not be all about luxury and extravagance, but if you are prepared to endure the heat and walk around with dust covered faces, this country holds value way behind the touristy 5 star resorts. An education in the waiting; a history that wants to be heard; the gratitude and smiling faces of Cambodians. Those are the memories you walk away with and get to hold close to your heart forever more! –PLEASE PIN ME! PLEASE PIN ME! Always check with your preferred doctor in regards to vaccinations required for countries you will be visiting, however according to the CDC site, the following are recommended vaccinations for travels to Cambodia. Hepatitis A due to the possibilities of contaminated food and water in Cambodia; regardless of where you are staying or eating. We chose to get Hep A, Typhoid and grabbed some Malaria tablets as we were travelling to Cambodia with kids (and a pregnant wife). We did consider the Rabies one as well as there are LOADS of dogs roaming freely around Cambodia. However, we just stayed clear of all the pooches and puppies and took precaution that way. A passport and visa is required for most visitors to Cambodia. Visa exemption exists for the following nationalities: Laos, Malaysia, Philippines, Singapore, Vietnam, Thailand, Indonesia (who can stay in Cambodia for 21 and 30 days – see this site for more information). 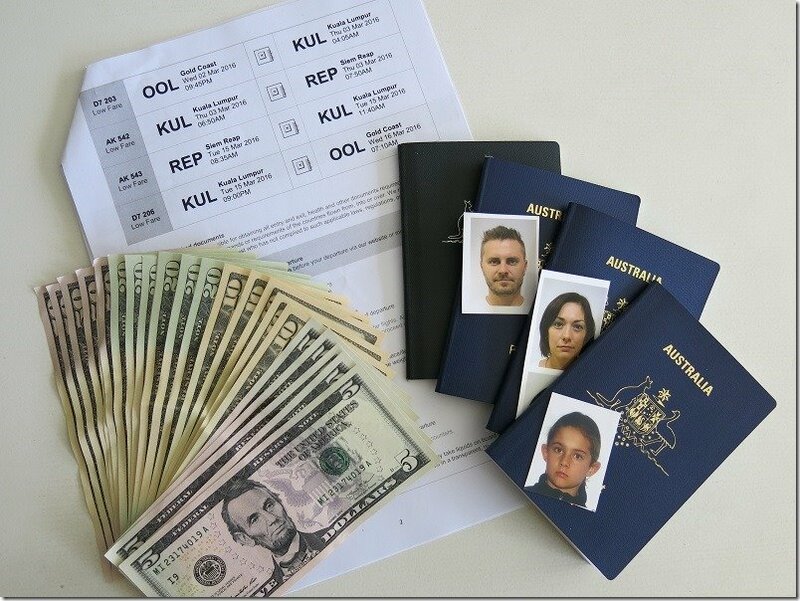 All visa options mentioned below require a passport that is valid for at least six (6) months from the expiry date, 01 recent passport-sized photo as well as blank pages in your passport. Visa on Arrival: Visitors can purchase a visa at the airport in Phnom Penh, Siem Reap and borders. Current visa cost (one month stay) is US $30 per adult, kids under 12 years of age are free. Your fees need to be paid in US currency and in cash (We recommend EXACT change)! E-Visa: There is also an option to get your visa sorted online pre-travels. The e-visa option will cost you slightly more at US $40 (US$ 37 Visa fee + US $7 processing fee + US $3 Credit Card fees), kids under 12 years of age are free, however, processing fees will still apply. Please note that the e-visa is not accepted at all border crossings, so please check before you proceed. You can organise your e-visa through their website here. Cambodia Embassy Visa Application: You can also choose to apply for a visa through the Cambodian Embassy pre-departure. Use this site for more information. Some nationalities are required to get a visa in advance at Royal Embassy of Kingdom of Cambodia in their country: Afghanistan, Algeria, Arab Saudi, Bangladesh, Iran, Iraq, Pakistan, Sri Lanka, Sudan, Nigeria. We decided to save money and chose the visa on arrival option. We arrived at Siem Reap airport, the whole visa process only took us around 15-20 min and was super easy and straightforward! People still question whether Cambodia is safe or not. Given its depressing history and the fact that landmines are still being uncovered in this day and age, I guess it is a fair question to ask. Be rest assured though that all touristy areas of Cambodia have been cleared from landmines. Despite its history of killings, Cambodia in 2016 is a perfectly safe country to visit, safer I would say that a lot of other countries. Whilst we recommend exercising normal precautions to look after your belongings as you explore; just as you would in any other country; we found nothing but friendly, happy, smiling people who welcomed us with open arms to their country. 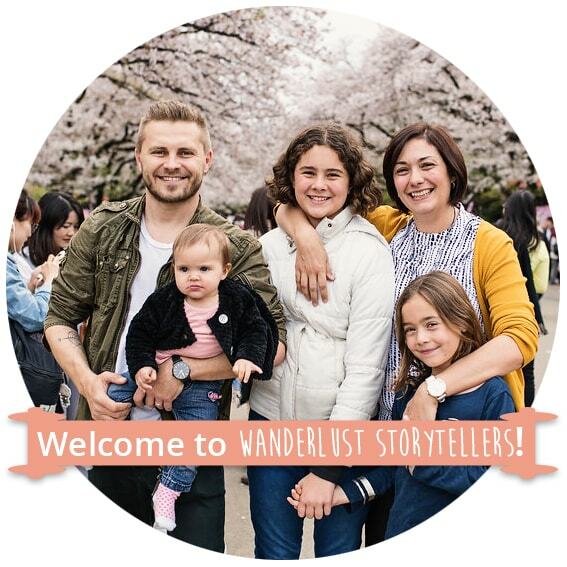 We felt safe, safe enough to explore the majority of the major tourist destinations on our own terms, without having to be in tour groups or with guides. 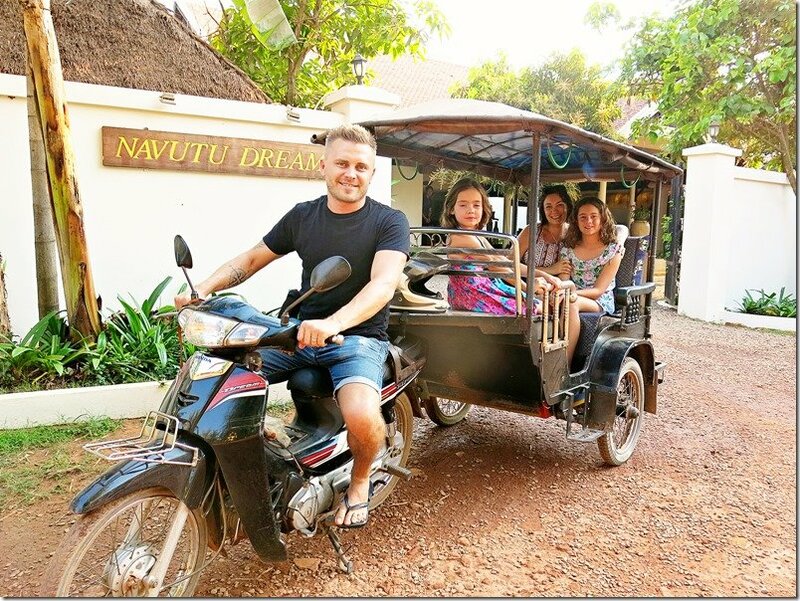 Cambodia Family Holidays – Good or Bad idea? 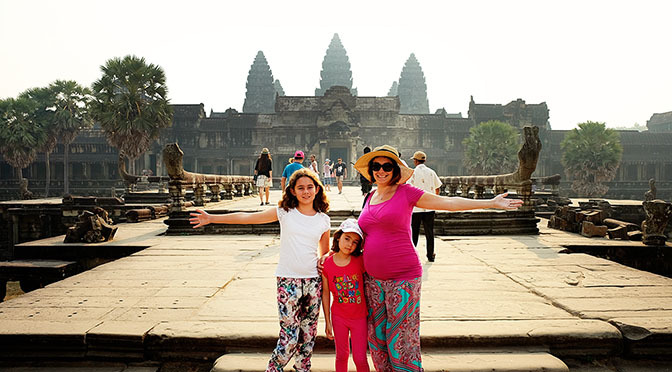 We travelled through Cambodia as a family with two younger daughters. We believe that there is insurmountable value in the education that comes from experiencing and observing different ways of life, which are in such a contrast to our own. It was such an educational holiday for our children, in more ways that we can count. For us, the true meaning of travel does not lie in holidays which are dominated by luxurious resort stays, but in the adventure and exploration of life in the country. Exploring destinations in a mindful, open-minded and curious manner. Not only did we travel across this country with our two young daughters, but I was also in my second trimester of pregnancy. What a truly valuable destination for any family to experience! We travelled to Cambodia during hot season, we actually visited during early April. Whilst we managed to endure the heat, we made sure to avoid peak heat times in the day. We never had beautiful clear skies over the Angkor Temples (see picture below) so keep this in mind as well if you are a lover of photography! 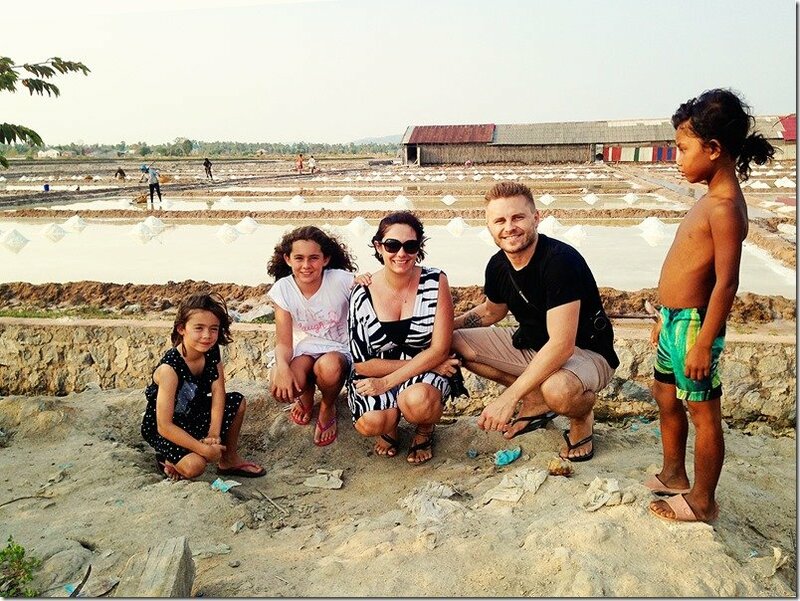 We also found that grass and so many landscapes were brown and dusty from the hot weather temperatures and kept saying how much better it would have been if we visited towards the end of the rainy season to see the country alive with lush green rice paddies and landscapes. In saying all of that, we didn’t have to brave as many masses of people at the temples and on occasions had corners of the Angkor temples all to ourselves! 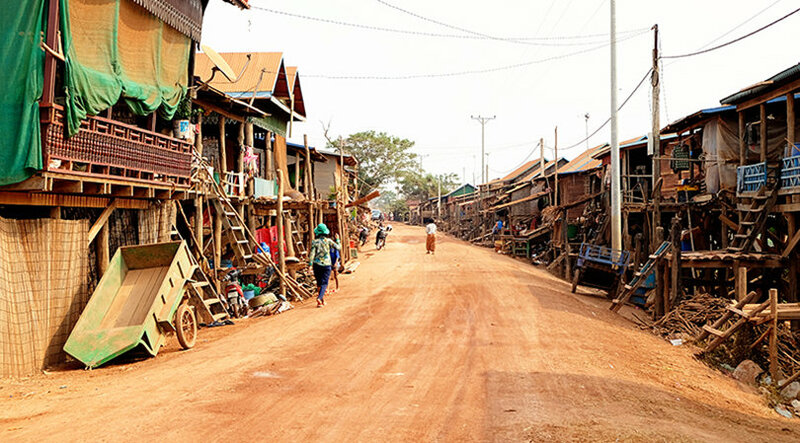 Our visits to the Cambodian islands were quiet and peaceful and accommodation choices plentiful! High Season: November to March – Definitely the best weather of the year in Cambodia. Weather will be cooler and a bit windy in comparison to the rest of the year. Due to the great weather, this season will of course be the one that leaves you scrambling for a space in between the hoards of tourists. Make sure to pre-book your accommodation if you wish to travel in this period. Shoulder Season: July to August – Shoulder season means wet weather. The showers are typically short but accompanied by high humidity. A great time to travel though if you would like to see the country at its best with green landscapes. Low Season: April to June & September till October – April and May defines what the hot season is truly about! Be prepared for smaller tourist crowds, but extreme heat! September and October can be wet. Cambodia is a tropical country, where warm temperatures always accompanies your explorations. With a temperature range of 21 to 35 °C, choosing the right season to visit becomes very important. Most tourists find it excruciatingly hot in April and exploration becomes more challenging. Cambodia has two very contrasting seasons in a year: dry season and wet (Monsoon) season. The best time weather wise to visit Cambodia is during December-February. These months are described as the ‘cool’ season, although temperatures can still be on the warm side, it is a lot more manageble. Be aware though that whilst you might have the best Cambodian temperatures, you will aslo be competing for space in the masses upon masses of tourists. So seeing those all important temples up close might be a challenge in itself! Hot season is from March-June. The temperatures will generally peak at 40 °C in April making it the hottest month of the year. Not only will you have to try and survive and endure insane temperatures, but the high humidity will drain you pretty fast as well. You will also find that you might have hazy skies that are a result from slash-and-burn farming methods. Wet season is from June-September and October-November. Expats believe that rainy season is the best time to visit Cambodia as you will get to experience the country without the hoards of tourists. Be aware though that umbrellas will be pretty useless during the monsoon season, so take a poncho and be prepared to get a bit wet. The local currency used is Riel, however it is more common for tourists to use US dollars than it is to use Riel. Pretty much all prices quoted in shops and restaurants will be in US dollars and whilst you might get small change in the form of Riel, most of the time all handlings will occur in the dollars. It does also make it easier to exchange money back home as most currency stalls do not want Riel. To check out current exchange rates, we love using XE.com. ATM’s are readily availability in most locations, unless very remote and rural. Credit card payments are also accepted at most hotels and restaurants in the larger cities. We had no trouble getting hold of more money as needed throughout our trip in Cambodia. Khmer is the traditional language spoken across the country. English and Chinese is spoken in Cambodia as well. If you are planning on visiting countryside regions or smaller towns, English spoken will be limited or ‘broken’, so it will be important to learn a few key phrases to help you along! Siem Reap and the Angkor Temples: Siem Reap must be the most visited town in Cambodia. It is a great little place to base yourself as you explore the world’s most impressive archaeological site (The Angkor Temples). 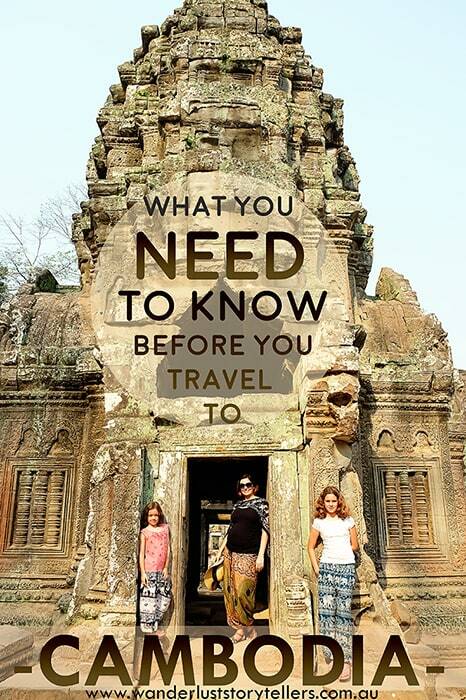 Be prepared though as Siem Reap is nothing but touristy. Still a great spot to hang out, eat, get a massage and enjoy some night life! 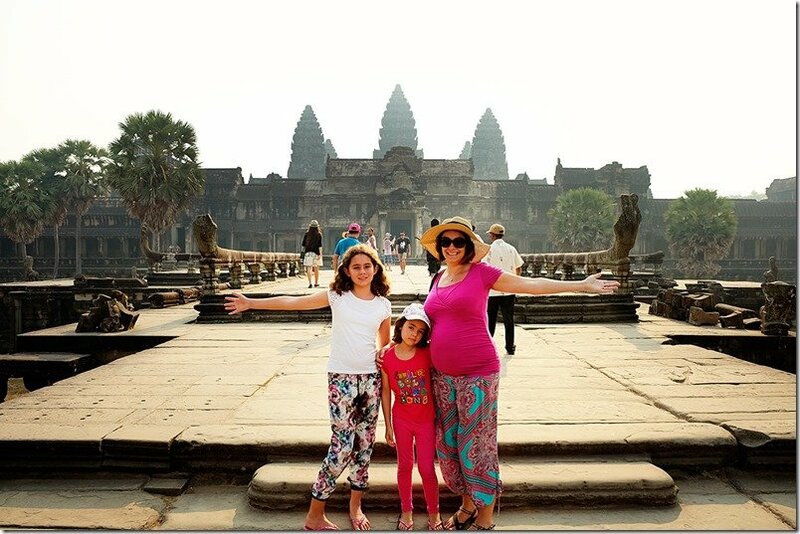 To read about our exploration of the Angkor Temples with our kids, click here. You can also find more information and review of an awesome tour to Kampong Khleang and the little villages around Siem Reap in our post here. Phnom Penh: The capital city of the Kingdom of Wonders. This city is large in size, chaotic in design and simply buzzing with activity. Tourists attractions here mainly centre around the Palace and the sad horrendous history found at the National Museum and Tuol Sleng prison. For a break away from the crazy busy feel of the city, why not enjoy a relaxing slow-paced Phnom Penh Cruise on the Mekong river. Battambang: Set along the banks of the Sangker River, this town is a little oasis away from the busy touristy cities. It also happens to be one of the country’s best-preserved colonial-era towns. A popular favourite tourist activity here is to experience a ride on the bamboo train. Kampot: Set in a beautiful setting next to Praek Tuek Chhu river with a backdrop over Elephant Mountains in the distance, this little laid back town located on the South Coast will allow you to slow down! Loads of river activities will fill your days here, together with expeditions to Bokor. Kep: A tiny, sleepy coastal province known for its crab dishes as well as its access to gorgeous tropical islands. The town itself has lots of crumbling villas from its former glory as a French colonial resort town. We loved heading down to the Crab Markets in the morning and highly recommend a hop over to Rabbit Island for a day excursion as well. To read more about Rabbit Island, click here. Kratie: Kratie is the place to go in order to try and spot one of the rare freshwater Irrawaddy dolphins. A hot popular stopping point on the road from Phnom Penh to Laos, why not enjoy a homestay here. Ratanakiri: For lovers of trekking through jungles, here you might encounter some elephants or gibbons. One of Cambodia’s most remote and pretty provinces, a place to loose yourself in the a world of jungle, waterfalls and ethnic minority people. Sihanoukville or Otres Beach: Sihanoukville and Otres beach are reknown for their beaches. Sihanoukville is the perfect place to stay when you are after a party atmosphere. Groups of people congregate here to loose themselves in loud music, in loads of drinks and some ‘happy’ pizzas. If you are after a quieter, more laid back beach atmosphere, head to Otres Beach. Whilst Otres Beach 1 will give you a mix between a slightly less quiet beach than Sihanoukville, this beach is very quickly rising up to the same loud party style beach of Sihanoukville. The furthest beach, which is Otres 2 will still provide you with a quieter haven to call home whilst soaking up the sun. Koh Rong Islands: Home to some of the most beautiful Cambodia beaches. These two islands lie within easy reach by speedboat from Sihanoukville’s coast. Whilst both islands provide you with idylic beaches, it is important to put thought into which island best suits your needs. Koh Rong Island itself is the home to backpackers and party-goers. Whilst some resorts on the further edges of the island will provide you with a peaceful, quiet space to relax, most of the resorts here are known to be within hearing reach to the loud music and happy noises of those who are looking for a fun time! If you are after a quiet alternative to the party island, it might be worth your while looking into a stay at the smaller island: Koh Rong Samloem. More laid back, and more raw, Koh Rong Samloem is the ultimate place to unwind in peace and quiet! You can read our post about Koh Rong Samloem island here. As with most Asian countries it is important to bring your bargaining skills with you. Bargaining is expected in the marketplace and smaller shops that are created for tourists. Also feel free to bargain when it comes to Tuk-Tuks and Taxi transfers. Prepare yourself for some typically Asian crazy driving! Especially in the insanely busy Phnom Penh city! I was amazed at the amount of traffic and the ability of the drivers to squeeze into spots that do not seem to exist! Mosquitos can be a real pain, make sure to take DEET mosquito spray, especially if you will be out and about at dusk and dawn! We did not really find vendor hassling from the locals to be a major issue. We did on a few occasions have some pretty persistent sellers and beggars annoy us a bit, but through the majority of our trip, a quick ‘no thanks’ was al that was needed to send them on their way. Expect to be covered in a light layer of dust after your explorations in the day! There seems to be dust everywhere and when exploring on a scooter or a Tuk-Tuk there is no escape away from it! Nothing that a quick swim in the pool or a light shower can’t fix though! Expect to find herbal takes on the traditional coffee. We found that most coffee tasted very different to what we were used to. Not our favourite way to enjoy coffee, but we did get used to it after a few days! Do realize that this country is a hot country, if you are traveling during the hot season, take some umbrellas with on your explorations so that you have some shade! Especially useful at the Angkor Wat Temple. How much is this? – Tah ni thliy pun mann? Where is…? – (Name of location), nouw ey na? Grab yourself the Lonely Planet Cambodia Guidebook, seriously who doesn’t love the wealth of information that Lonely Planet manages to pack into their guidebooks! We love getting the Kindle version. After stories about our travels to Cambodia? Click to read our comprehensive, informative stories! Cambodia sounds like a fantastic place to visit though thank you for pointing out about the safety. I am sensitive to hot temperatures so definitely I am not going to visit around March – June. Amazing post, thank you! Hi Udaya, I think you will struggle to find veggie restaurants but you will be able to find plenty of veggie dishes in the normal restaurants, so I think you will be just fine! Yes I would say 4 days in Siem Reap will be enough, you could spend 2 days on the temples, 1 day on the rural life and local villages and 1 day to explore the city. Other areas that we really enjoyed were, Kampot & Kep and Koh Rong Samloem Island if you are after a bit of relaxation 🙂 PP is very popular … but we didn’t enjoy it there as much. Have a fun trip!! I found your blog via a tripadvisor forum comment. So thorough! My husband, 3 year old, and I are planning a trip to Siem Reap in December. Our only conundrum now is that we were going to try to get pregnant with #2 between now and then… but everything I’m reading warns that pregnant women should not visit because of Zika. Just wondering if you’d hears anything similar when you visited. Thanks! Hey thanks for all the tips and suggestions. 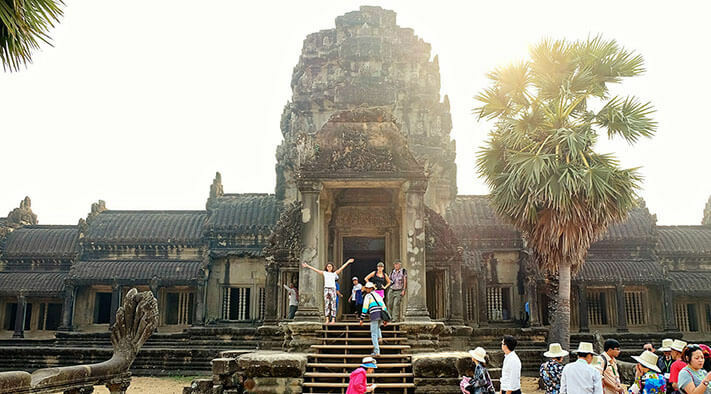 Cambodia is gradually looking to make presence in travelers wishlist. Planning for the same in Feb or March 2018 considering it will be a budget tour. Thanks for all medical advises and other suggestions once again! Hello, my girlfriend and i are planning to visit Cambodia for two weeks in the middle of January. Do you think renting a car and driving around and discover the country is a good idea? Hi Daniel, I would stay away from Car Rental. Driving in Cambodia is a pretty hectic and crazy affair. Some destinations are also really far apart, such as Siem Reap and Phnom Penh and you won’t see much on the drive, so it makes more sense to fly and have more time to explore, rather than being stuck on a boring road in your car. Hoping to travel end of June into July with our 3 kids, will b 2.5, 5 and 7. Would be great. Also do you recommend airb&b. Sorry accomadation for phnom Peng, Kampot, kep and Koh Rong Samloem. Such a great blog! 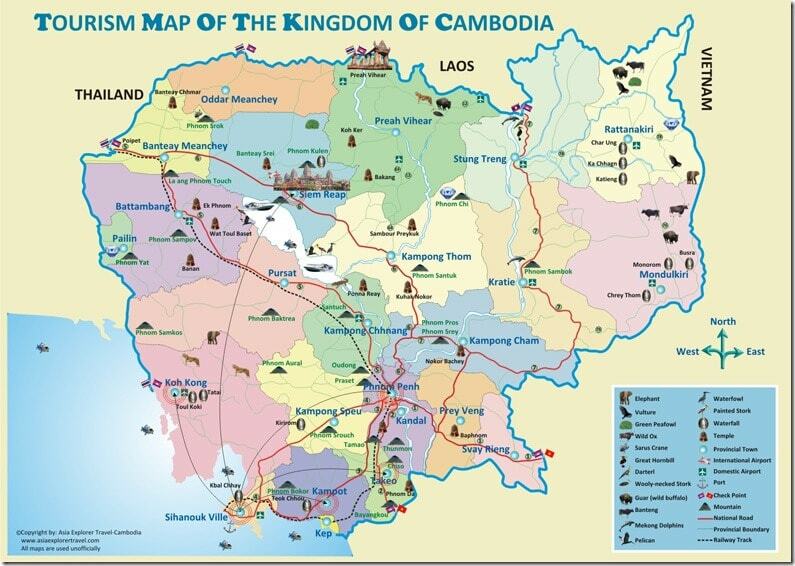 I myself am Cambodian and I cannot wait to go visit the homeland soon! My question is, being pregnant while you traveled, were you ever worried about getting zika from the mosquitos? I travelled to Cambodia from India. I loved the country and its rich History. All our bookings were taken care of by a company called WiseYatra( #9717559499) We were so surprised to have visited the country without spending much. Must visit country for globe trotters!